Thermo-Tech introduces a new heated chute, bin, and hopper liner system. 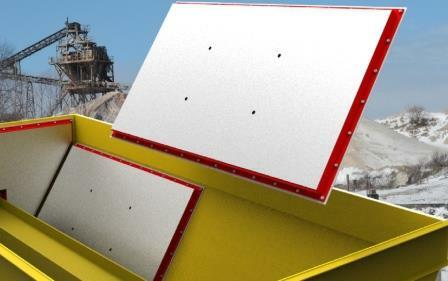 Thermo-Tech introduces a new heated chute, bin, and hopper liner system that eliminates materials from freezing or sticking. This new concept retrofits to almost any existing problem area. When installed, these liners will keep material moving at any temperature and eliminate material sticking due to moisture and high humidity. They are custom fabricated to fit the exact application, welded or bolted in place, and are available with any wear face desired, such as AR400/500, stainless, TIVAR, UHMW, or ceramic. Additional wear liners can be overlaid in the field. Heated panels are also available to attach to the outside of the affected area when it is unfeasible to gain access to the inside. The replaceable heating element has a five-year warranty and is available in any voltage from 120 to 480 AC and 12 or 24 VDC.